Since its origination in 1996, over 4,500 nonprofit organizations have implemented the Benevon Model. “Creating sustainable funding for nonprofits,” this model consists of a four-step process to improve their financial health, primarily by focusing on large gifts. The process, which relies heavily on meeting prospects face to face, takes some time but seeks to develop “lifelong” supporters who will sustain your organization. When you couple the Benevon model with fundraising software, it can amplify the model’s success for your organization. It enables automation that saves time and lets you focus more on donor cultivation, an important component of Benevon. Software also helps you expand the number of donors you could engage, beyond just those you meet in person. In this sense, you can become truly scalable and have the most impact possible. To help you understand how the Benevon model can work alongside fundraising software, we break down the four phases of the model and suggest ways you can incorporate software like Classy to power your success. In this first phase of the Benevon model, one of your organization’s ambassadors—perhaps a staff member, volunteer, or existing supporter—invites their friends, or potential donors, to a short event. At the event, the organization collects the contact information of guests and provides educational information in the span of an hour. It also seeks to develop an emotional connection between your organization and potential donors. Fundraising software with event registration capabilities can collect your guests’ information ahead of time in one centralized place. By managing the event online, you make it simple for your ambassadors to extend invitations to multiple individuals and share event information and logistics. Software also helps you grow the scope of your event, allowing you to meet people outside of the circle you’d be limited to if you restricted your invitations to in-person meetings. With online event pages, you can distribute event information to a large number of potentially interested people. Additionally, event software can help you engage a younger demographic accustomed to submitting RSVPs online and sharing their plans through social media platforms. The second step of the Benevon model involves two parts. First, nonprofits follow up with their guests and ask for feedback on the event experience. They also ask guests if they would like to get involved further or invite anyone they know to a future event. 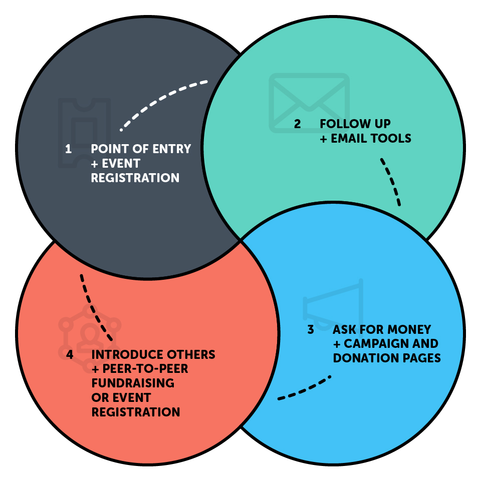 In the second option, the organization removes guests from the potential donor funnel and asks if they can recommend anyone possibly interested in the cause. Further communication is not pursued. Instead of focusing on multiple-year giving, with online software, you can easily create a recurring revenue campaign that highlights the specific, lasting impact one makes with a monthly donation. A $1,000 gift a year turns into $83 a month. Suddenly, this number is much more approachable to younger professionals and may help you to secure even more sustainable funding. And with Classy, you can create a beautiful crowdfunding campaign that brings your brand front and center and helps donors see what their monthly gift accomplishes. Fundraising software also helps you approach people in a way that resonates. While in-person asks are undoubtedly a worthwhile strategy, in today’s day and age, consumers tend to make purchase decisions online. You can create custom Classy donation forms and tailor them to specific donor segments and their interests. Plus, a mobile-responsive page is perfect for anyone on the go. In the final phase of the Benevon model, organizations host a donor cultivation event. The purpose of this event is to let donors know you appreciate them, encourage them to get further involved as ambassadors, and to invite their friends to join the cause. Fundraising software is a development and marketing tool that helps you build your relationships with donors. For example, email automation tools can educate donors near AND far about how they can volunteer their time as ambassadors. Alternatively, you don’t even need to necessarily call your donors “ambassadors.” You can simply let them know how they can further support the cause, such as by creating a peer-to-peer fundraising page and sharing it with their personal network. While the Benevon model can grow your nonprofit’s sustainable revenue, fundraising software enhances the entire process so you can not only build sustainable revenue, but scale. Interested in learning more about how software fits in with Benevon? Chat with a Classy representative below.